For large orders or questions, please call Beth Georgette @ 609-599-4594. Allow 6-8 weeks for delivery. As your child grows up, many activities - sports, music, clubs, jobs - can compete with their school work. This brochure shares tips for parents to help their children find the proper balance between academics and activities. We all have a role in making sure children’s travel to and from school is safe.This brochure reinforces bus safety rules for walking to the bus stop, waiting for the bus, getting on the bus, riding on the bus and getting off the bus. Children thrive best in an environment with clear and consistent boundaries and expectations. The objective for parents is to approach discipline as a learning experience, not simply a punishment. 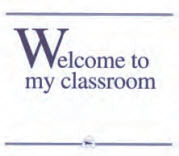 This brochure gives parents strategies for communicating expectations and helping children thrive. The attention and interest we show our child now creates the confidence they’ll need for a successful future. This brochure delves into ways for parents to reinforce learning at home. This brochure provides tips and suggestions for parents to help their children with homework. This brochure provides parents with the information they need to keep kids safe online. This brochure helps parents and students explore their options and help them plan for successful futures. It takes the whole school family to provide children with a quality education. This brochure describes many of the school staff positions, from custodians and maintenance staff, to food service personnel, to transportation staff, and paraprofessionals. This brochure presents specific guidelines for monitoring children’s use of television,video games and the Internet, and gives tips for establishing rules and offering healthy alternatives to these activities. This brochure presents specific guidelines for monitoring children’s use of television, tablets, video games and the Internet, and gives tips for establishing rules and offering healthy alternatives to these activities. Special education laws can be daunting, especially for parents preparing for their child’s first Individual Education Plan meeting. This brochure explains the IEP process, gives suggestions for preparing for the IEP meeting and recommends additional strategies to help families navigate special education regulations. 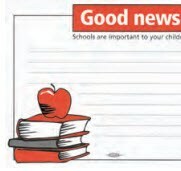 Studying, preparing for tests, taking the test, taking lecture notes, reading and study skills are all topics discussed in this brochure designed to assist parents in helping their children meet their full potential in school. 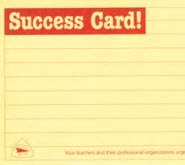 Note card (4” x 4”) for communicating with parents. Inside text reads: “Children depend on their teacher for academic instruction.They need their parents’ help to become better students. Let’s make this year your child’s best for learning and growing. If you ever need to talk with me please call. Remember … children learn more when we work together.” Right side is blank your comments.